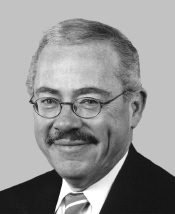 Bob Barr (1948–Present), Christian conservative and strict constitutionalist, and was the 2008 Libertarian Party candidate for President of the United States. As a former Representative of Georgia's seventh House district, he gained a reputation as a staunch social conservative, outspoken on the war on drugs and gay marriage. Prior to his congressional service, Barr was appointed by Ronald Reagan to be a US Attorney. Barr also served for a period in the Central Intelligence Agency. Barr is a Christian with strong support among evangelical voters. He strongly opposes abortion and he campaigned his Presidential run largely in opposition to Roe v. Wade, a controversial Supreme Court decision that made abortion legal in the United States. While a Congressman, his most notable achievement was the Defense of Marriage Act (DOMA) which stated that only a man and a woman could be legally married. He wrote the bill which was signed into law by President Bill Clinton in 1996. During the Clinton-Lewinsky scandal, Bob Barr became nationally recognized as a major proponent of impeachment. As a Libertarian Party statesman, Barr consistently supports a weaker federal government and believes that many federal laws should be decided by the states. This is the case for defending marriage, which he decided should be done by the states rather than the federal government. He has also recently expressed reservations about the negative effects of the War On Drugs from a libertarian perspective. Consistent with this new position, he changed his stance on medicinal marijuana and later approved the purchase of a block of Blue Moonshine to aid an ailing family member. During his 2008 Presidential run, he campaigned on a platform of restricted central government, including the federal bureaucracy, regulation, and Nanny state policies. Barr is well known in his home state of Georgia, where he is acclaimed for his staunch defense of social issues. In his Presidential race, he lacks the national name recognition necessary for a major campaign, and has surfaced only rarely in the media. His campaign has been considered a political threat for Republican candidate John McCain in the 2008 election because Barr has strong credentials among Christian voters that may siphon off votes for McCain in important swing states. Despite these concerns, Barr ultimately didn't pose much of a threat to McCain and finished a distant fourth place, behind even perennial third-place finisher Ralph Nader. In fact, more Christians went directly from McCain to Barack Obama than to Barr. Barr is a lifelong supporter of the Second Amendment and has been a member of the Board of Directors for the National Rifle Association since 1997. He fiercely opposes gun control and other measures that limit personal liberties, including warrantless wiretapping of American people for security purposes. Civil liberties are a major issue for him as a politician, and he has been outspoken against the Patriot Act and FISA, two laws that restricted the rights of Americans to help fight terrorism. Barr made an appearance in the film Borat as himself. This page was last modified on 26 September 2018, at 08:55. This page has been accessed 14,851 times.